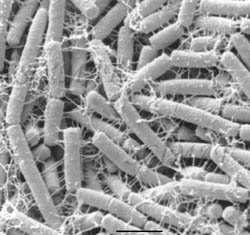 Bacillus cereus has been recognized as a microorganisms which causes food poisoning for more than half a century. 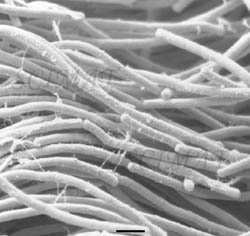 Similar to other bacilli, B. cereus forms endospores which allow it to survive harsh conditions. Unlike B. anthracis, B. cereus is a motile bacterium. It is known to inhabit many kinds of food including stew, cereal, and milk, and most recently it has been found in fried rice. Recently, B. cereus has been implicated in bacterial endophthalmitis. 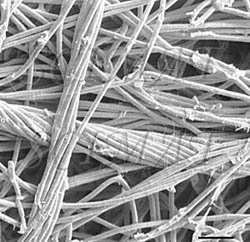 It is a potentially blinding disease that can result from introduction of microorganisms into the eye. Additional information on B. cereus may be found in the "Virtual Museum of Bacteria". For comments and information on the use of the micrographs, please contact the author.